As The Boy’s birthday loomed I began to ponder what kind of cake to make him. I asked, and he said “Something chocolate.” Then he thought a little longer, and suggested the cake we had on my birthday, Hershey’s Perfectly Dark Chocolate Cake with White Chocolate Frosting. 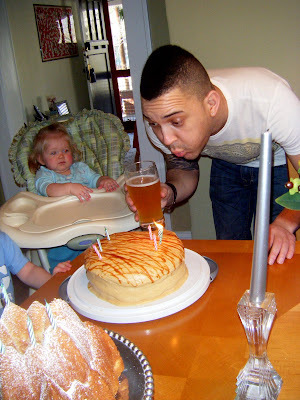 While I was flattered to know he really liked that cake, I was itching to try something new! I asked him if he was ok with me surprising him with a cake/frosting combo, as long as it included chocolate. Luckily, he was fine with that. After a lot of browsing, I was finally inspired by the sweet & salty combination of a cake in the Baked cookbook. The Boy loves salty flavors. 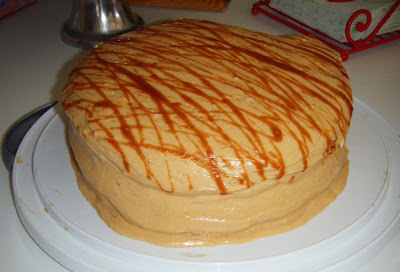 I didn’t use the Baked recipe, because I already felt really comfortable with the Hershey’s recipe for the cake (which I previously made with Pumpkin Cream Cheese frosting), and I found this recipe for Salted Caramel Frosting that seemed pretty easy. I’ve made homemade caramel in the past, and it’s such a decadent treat. It’s QUITE addictive, so I can’t let myself do it more than once or twice a year! This (and I think I say this every time, but I really really mean it) is my favorite cake & frosting combo I’ve ever made. Wow. It truly was amazing. I can’t say enough about it, you really MUST try it. 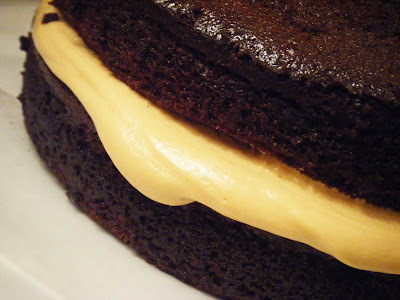 The frosting, which uses cream cheese & butter, as well as homemade salted caramel, is definitely not a stiff frosting. This cake is best kept in the fridge. Luckily because the cake is SO moist, it won’t dry out. If it’s kept in the fridge, the frosting will stay stiff and more stable, but if it’s kept too warm it will begin to droop a little. One thing I do suggest is… don’t try to put the cake in the car and drive all the way from Nashville to Atlanta. There’s a chance this could happen. I guess the weight of the frosting, as it began to warm up in the car, pulled heavy on the soft moist cake, and perhaps one of the curves coming down the big ridge pulled some of it down! 🙁 Oh well. I’m just bummed I didn’t get a good picture of it before we left town. This was the best looking cake I ever frosted! It just didn’t survive the trip down. If you’re looking for a cake & frosting combo that is unlike anything else, and you want a cake that will truly appeal to adult palates (without using alcohol, shocking for me, right? ), then look no further than this cake. 3. Bake 30 to 35 minutes or until wooden pick inserted in center comes out clean. Cool 10 minutes; remove from pans to wire racks. Cool completely before frosting. 1. 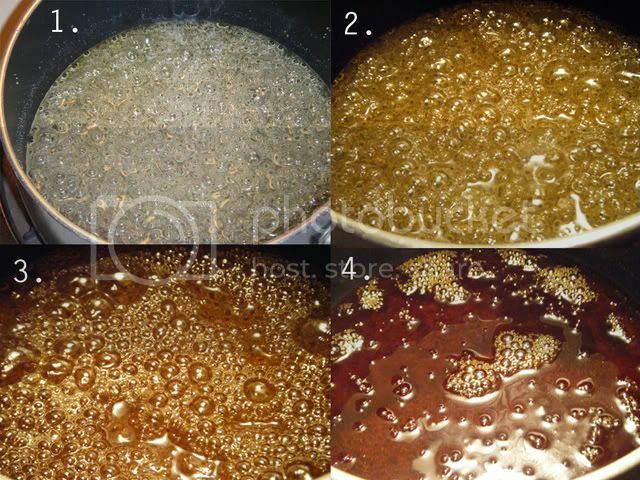 Combine the water, sugar, and the corn syrup in a deep saucepan and cook over medium heat. Stir together with a wooden spoon until the sugar is incorporated. Cover the saucepan and let it cook over medium heat for 3 minutes. 2. After 3 minutes, remove the lid, increase the heat to medium-high, and bring to a boil. Do not stir from this point on, but it is important to carefully shake the pan so that one area of the caramel doesn’t burn. Continue to cook until the caramel turns an even amber color then remove from the heat and let stand for about 30 seconds. 3. *** This is the dangerous part *** Pour the heavy cream into the mixture. Wear oven mitts, stand away from the pan, and be careful. The mixture will bubble up significantly. Stir the mixture, again being careful. Add the butter, lemon juice, and salt. Stir until combined. 4. Measure 1 cup into a Pyrex measuring cup. Stirring occasionally, allow to cool until thick like molasses and warm to the touch, about 20 minutes. 1. Bring butter to room temperature by letting it sit out for 1 or 2 hours. Beat butter and cream cheese at medium speed until creamy. 2. Sift 3 cups of powdered sugar into the butter/cream cheese mixture and beat to combine. Add 1 cup of the salted caramel and beat to combine. Sift 2-3 cups of powder sugar, in 1 cup increments and beating between each, until you arrive at the thickness and sweetness you desire. I used somewhere between 5-6 cups. The frosting wasn’t super thick, but it was starting to get pretty sweet. 3. Let frosting set up in the refrigerator before using. After frosting the cake, keep it in the refrigerator before serving for a prettier cake! The stages of it turning to amber color. I let mine get to a pretty dark color amber to have a strong caramel flavor. Also, in my experience it will continue to cook, and get a little darker, even after you remove it from the heat, before adding the cream. 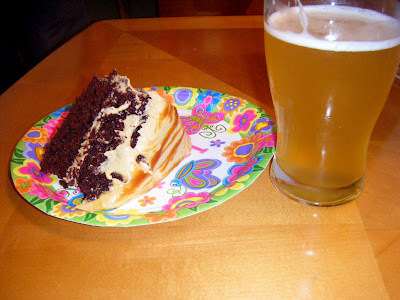 Apparently, this cake goes well with Yazoo Hefeweizen. This is a beautiful cake, happy birthday to the boy! This looks and sounds amazing! I love salted caramel. What a great idea to make it into a frosting! Oh my gosh that looks amazing! Not only is it a beautiful cake, it sounds soooo delicious!!! This looks amazing – great job! Oh my – this looks awesome! Kudos on a fabulous cake! Oh, shoot, Erin that frosting does look fabulous! The droopiness of the frost appeals to me, very much! 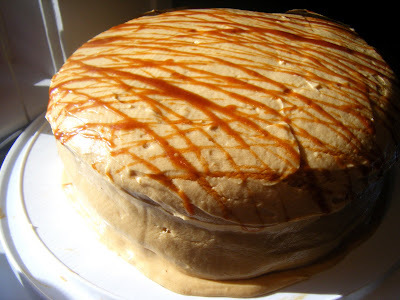 I have a banana cake in the freezer and I’ve been wanting to make some caramel frosting for it. I’m soooo excited thanks for passing it all along (the cake looks good but I’m not a real fan of chocolate).YAY! Beautiful job on your cake – I think I need to make it NOW! omg, yummy! I so want to make this! What a great birthday cake! The frosting looks delicious! yea!! It turned out!!! I bet that icing was delicious, too bad it was so thin :o( Wish I could have had a taste! Erin I made the frosting! Holy cow was it gooooood, seriously! 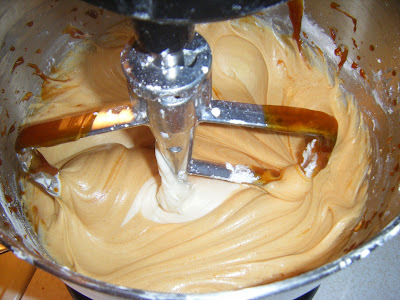 I made the full batch of caramel but only half the batch of frosting. My frosting was very soft as well but I knew it would be. I felt if I added more powdered sugar it would lose that caramely flavor as it was it was not as pronounced as when I first added the caramel in. 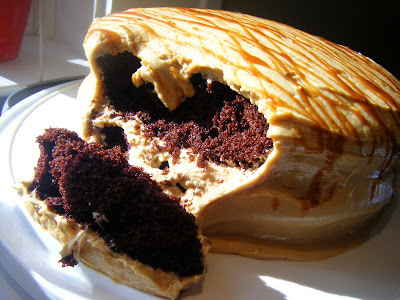 I wish I was better at this and could figure a way to get it thicker with out diluting the caramel flavor. Thanks for the recipe! This sure is one beautiful cake! it sounds delicious! I love anything with salted caramel! I just made salted caramel custard pots and now I want these! They look delicious! I'm a few months late on commenting, but I just wanted to say THANK YOU – we made the cake yesterday and devoured it. I made this cake for our anniversary, so delicious! It was the first completely from scratch cake I've ever made, and my husband and friends were impressed! Thank you for posting! Just made this cake … thanks for sharing this recipe! However, next time I plan on adding more salt to the caramel, maybe 1 teaspoon instead of 1/2, and less powdered sugar at the end (I put 5 cups as suggested). I found the frosting to be too sweet and not salty enough. I can’t thank you enough for this blog post! I’ve sent many folks to your blog for it. This has become a family fav and required for just about every autumn and winter occasion. I too add more salt to the caramel but other than that this recipe is perfection! We’ve found that the frosting recipe makes more than one cake worth so we save the remaining frosting in the fridge for a small batch of cupcakes whenever the want arises. I’m making my list of ingredients to make this cake and am very excited to try it! My family’s standard delish cake is Red Velvet from scratch with homemade cream cheese pecan frosting but I’m hoping this experience will create a new favorite. I’m making it for a Chocolate Potluck event next weekend. I’ll report back the results. I think I’ll try a bit more salt, as others have suggested. I hosted a Chocolate Potluck last night and made this recipe for it. It was unique of all the other choices, which was really cool. It took a LONG time for the caramel to turn amber and I was concerned that I had burnt it because when it finally did turn, it turned fast. 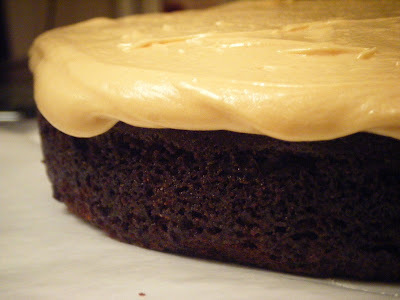 It tasted a little bit burnt even to me before I put it into the frosting but by the time the cake was ready to be served, the flavors had melded perfectly and it was divine. This cake was a huge hit with everyone who tried it. Check out the blog written about the event (mentioning my cake!) http://vnewman.wordpress.com/2011/02/13/chocolate-for-everyone-brought-to-you-by-lisa-betz-and-company/ Thank you!